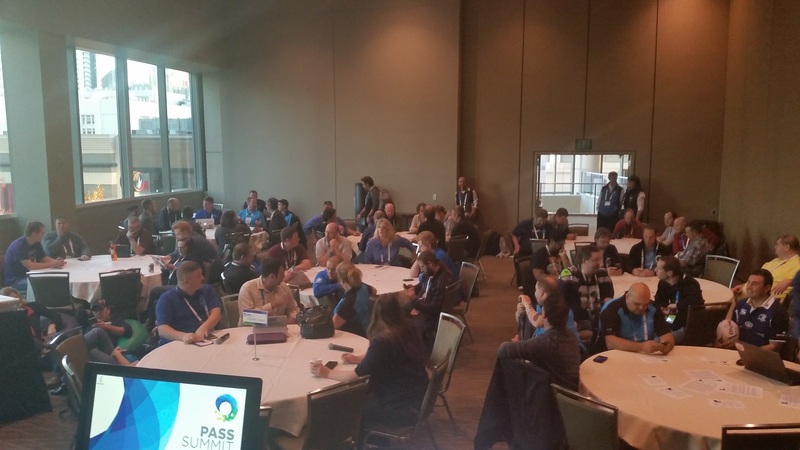 This year the SQL PASS conference held their first Speaker Idol contest with the goal of getting new speakers into the PASS Summit on the strength of their presentation skills instead of their abstracts. And I think I can safely say that it was a resounding success. We started with 40 people who applied (38 fellas, and 2 ladies) which were cut down to 12 people who would actually compete during the PASS Summit. Some people noticed that the 12 people who competed were all guys, which was strictly by chance. When selecting people for the 12 spots they were selected based on their answers to the sign up form, which I read and scored without looking at the speakers names. This review cut the list down to about 18 or 20 people. Those 20 were ranked based on speaking experience (were checked against PASS speaker lists from prior years) and the top 12 were invited to present in the speaker idol sessions during the PASS Summit. Sadly one speaker got sick during the summit and couldn’t compete, and there wasn’t enough time to fill the empty stop so we ended up with 11 people competing. And present they did. All 11 presenters did a fantastic job, as did our judges in providing feedback to them. Not only did the 11 speakers all do a great job, but they all took the feedback and the four who competed in the finals were even better the second time. The jokes were perfect, the timings were perfect, and some of the speakers took major risks which were so bold that I never would have taken them in a 5 minute session, but they nailed them perfectly. In the end we had a winner. That winner is our first PASS Summit 2015 speaker (though we don’t know what he’s going to be speaking on yet), and his name is Pieter Vanhove. Personally my biggest fear this year was that the room would be empty during the speaker idol sessions. My worries were set aside during our first session when the room was basically full. It was a little emptier the next two sessions, but for the finals session, the room was packed. With standing room only. Now I’ve heard a little bit of a rumbling about the judges selection of the wild card spot. People assumed that the wild card spot would be filled by one of the three runners up. The instructions to the judges was to select anyone that they wanted to see a second time. It could have been anyone from the competition who they felt could have done better than they did. In this case the judges opted to move Rob Volk to the finals in the wild card spot. For next year, I’ll work with PASS on how we want to define the wild card spot, and ensure that the selection criteria for that spot is better communicated to the contestants and the audience. So basically I’m going to fall on the sword on this one. I didn’t define that well, and I didn’t do a good job communicating what the rules around the wild card spot were to everyone. I hope that next year we can get the speaker idol sessions recorded and included on the USB drives as well as made available for viewing on the PASS Website. The sessions were all informative, entertaining and the judges feedback was very useful for those listening as well as those competing. I know that I got a lot of great tips from the judges, which I hope to include in my presentation style in future presentations. Overall, I think that the format worked pretty well. I think we need to get regular seats in the rooms so it’s more session like, and he had a little problem with the schedule (the app and my announcements said one time for the finals, but the printed signs in the convention center said a different time) but everyone was able to deal with the change (which actually is a realistic situation as room changes and time changes can happen at the summit). For everyone that applied to be in Speaker Idol, I thank you. Hopefully PASS will let us do this again, and hopefully I’ll see your name on the list next year. Keep presenting at your local and regional events to improve your skills, and hopefully I’ll see you at the 2015 PASS Summit as a speaker. For everyone that came to the Speaker Idol sessions, I thank you as well. The 11 speakers who were there did a great job, and it makes it a lot easier to present to a full room compared to an empty one (trust me, I’ve done it). Also, a big thank you to the judges who were willing to give up a decent chunk of their week to sit and listen to people give 5 minute sessions. Without everyone coming together like they did, this wouldn’t have been the big success that it was. Personally I hope to see a bunch of the 11 people who presented as speakers at the PASS Summit 2015 so that we can get a bunch of new people into the speaker idol in 2015. And to Luan who got sick this year, I hope to see you at the PASS Summit next year; just this time healthy enough to present a session.